Snugglebug University: Make Your Own Fabric Suitcase! 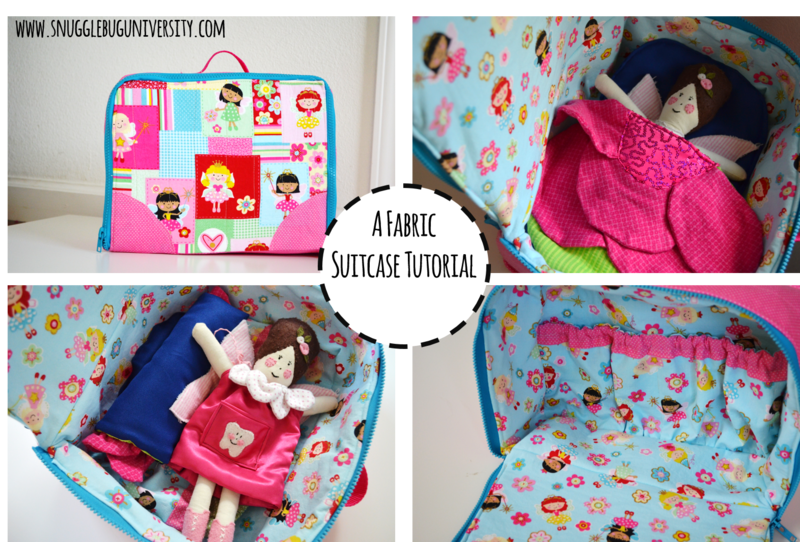 Make Your Own Fabric Suitcase! Last week I shared the presents that I made Ellie for her birthday, including this cute fairy suitcase, which was perfect for storing Ellie's Fairy dolls. 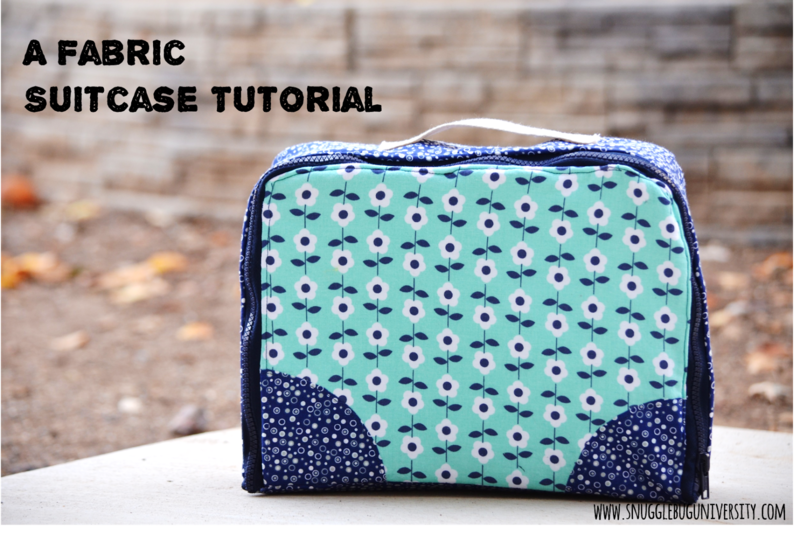 I loved the suitcase so much that I wanted to perfect my pattern and make more! Since I was working on my latest fairytale doll pattern at the time, I thought that they'd be perfect for storing these little dolls and their accessories. I really struggled about whether to include the suitcase in my doll pattern or if I should just post it here on the blog. A fabric suitcase has so many uses. In fact, I think I need my own to store all of my embroidery supplies! 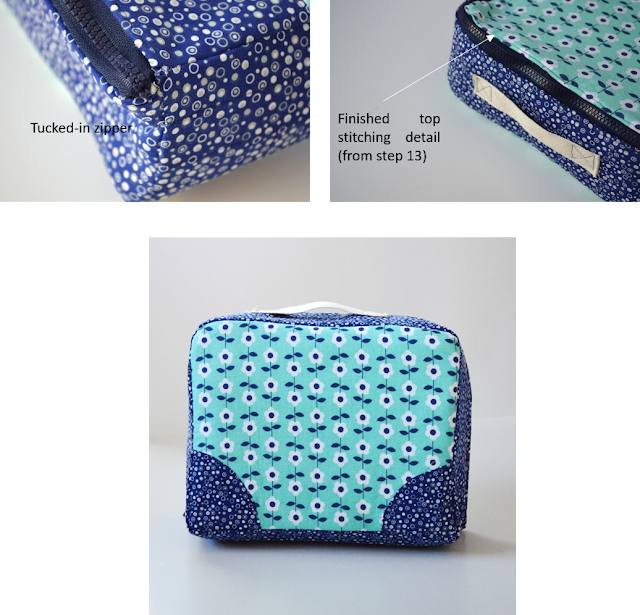 Or what if you purchased one of my other doll patterns, and wanted to make a suitcase to store it all in? 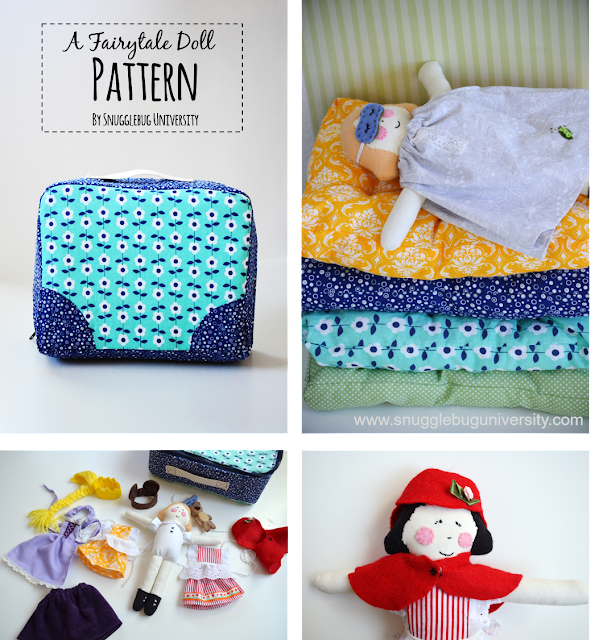 It didn't seem fair to make you purchase the fairytale doll pattern just to get the suitcase "how-to." Ultimately I decided to do include the tutorial both here on my blog and also in the fairytale doll pattern. So if you want the templates, fairytale dolls, and all those cute clothes, purchase the pattern (especially if you want to sell them). If you just want to learn how to make a fabric suitcase though for your personal use, keep reading below! 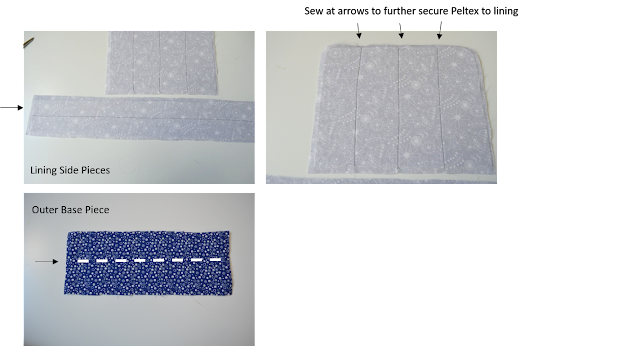 a small amount of fusible interfacing (such as Wonder Under). a small (5-6 inch) piece of trim for the handle. **NOTE: A zipper foot is helpful for this step. The main part of the suitcase is made of one long side piece, the base, and the suitcase front and back. My finished suitcase measured 12 inches (w) x 10 inches (t) x 4.25 inches (d), but the instructions here could easily be scaled up or down. The front and back of the suitcase are made from 11.5 inches x 9 inches rectangles. (The top corners are slightly curved to make it easier to apply the zipper. The long rectangular side piece is 28 5/8 inch long x 4 inches wide. The base is 11 3/8 inches long and 4 inches wide. The pocket pieces (cut 2 from the lining fabric) are 16.7 x 7 inches tall. Let’s get started. First you need to cut out fusible interfacing the same shape as your fabric corner pieces. These are the blue corner pieces on the suitcase. After the fabric cools, remove the paper backing. (2) The adhesive will remain on your fabric and look a little shiny. If the paper doesn’t peel off easily, you probably haven’t ironed enough, so just try ironing longer. Then iron to your base fabric (3). Sew along the edge of the just adhered suitcase corners to make sure that they are well attached. Then fuse the front of the suitcase to Fusible Fleece (cut to be the same size as your suitcase). Like in the previous step, place the adhesive side of the fusible fleece on the wrong side of your fabric. 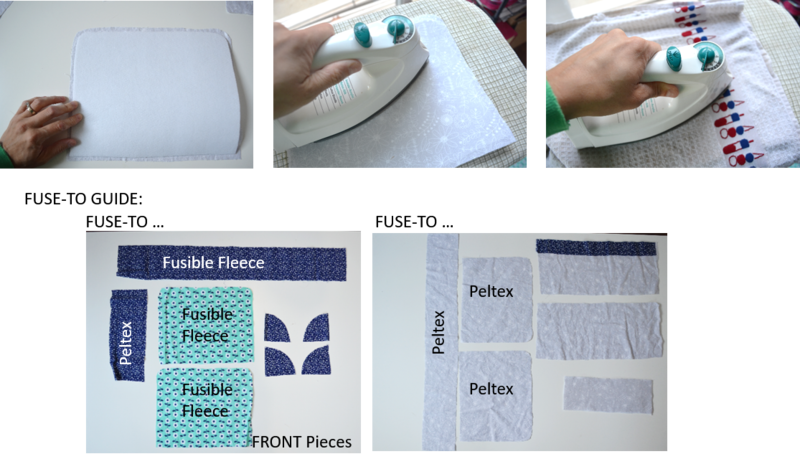 Iron on the right side of your fabric to adhere it to the fleece. The side piece is also fused to Fusible Fleece. Fuse as described above. Then attach the 1 inch handle piece (about 5-6 inches long) in the center of the long siding piece. Attach the handle at each edge of the ribbon, by sewing a X pattern. The base piece (and most of the inner lining pieces) are fused to Peltex. 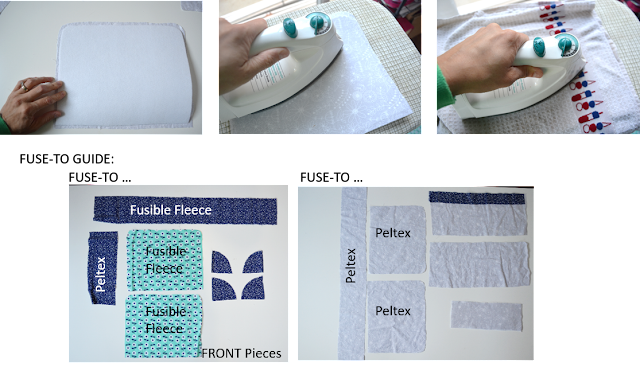 Unlike Fusible Fleece, the Peltex pieces are cut about 3/8 inch smaller than the fabric pieces. Peltex 71F Single sided ultra firm stabilizer is a super strong stabilizer that requires a heavy duty needle to sew through. Pieces adhered to Peltex should be cut 3/8 inch smaller than the actual pieces they will be fused to. Put shiny adhesive side on wrong side of fabric. Iron on fabric side (not Peltex side). Iron on high, putting pressure as you iron. Cover with a damp cloth and press firmly for 10-15 seconds, lift and move to next area until the entire area is adhered. Remove damp cloth and iron to remove extra moisture. Attach the outer base piece and the inner side lining pieces to Peltex. Fuse the long side piece to Peltex as well. Then, using a heavy weight needle, sew through the outer layer of the base. I sew once through the center. For the side pieces, I divide in half, and then divide in half again. This helps secure the Peltex to the pieces. Next we’re going to work on the inner lining pocket. If you’d like to add trim to your pocket pieces, do so now. 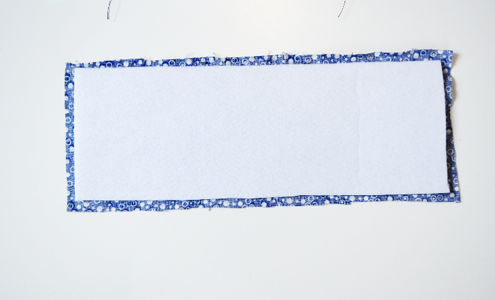 I sewed a 1.75 inch piece of blue fabric to the front of my lining pocket. Fold pieces over. Next we are going to sew a passageway for the elastic. Sew ½ inch down from the top of the pocket. Then use a safety pin to pull 11.75 inches of ¼ inch elastic through the passageway. Sew quickly through the elastic on each end to secure it in place. Run a gathering stitch along the lower side of the pocket. Place on top of the inside of the suitcase and adjust gathers to fit the correct length of the base. 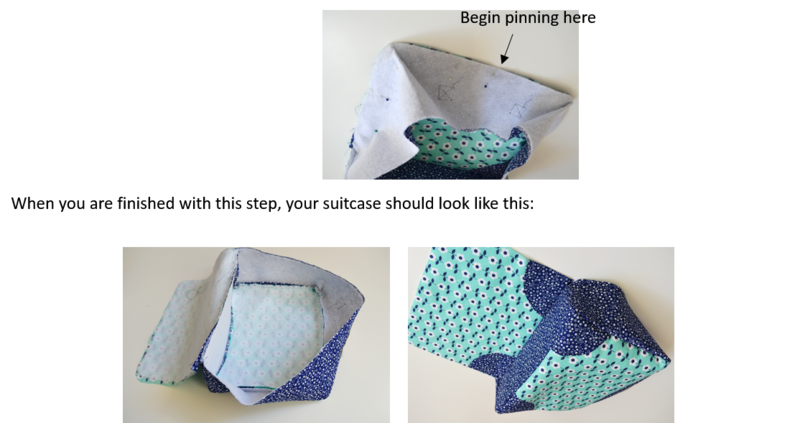 Sew down the middle of the pocket to divide the pocket into two and secure it to the back of the suitcase lining. Adjust gathers on base of pocket to fit the inside of the suitcase. Then baste in place. Now we are going to begin assembling the suitcase. Sew the main sides to the base using 1/4 inch seam allowance. Sew the long side piece to the bottom at each end. Sew the long side piece to back of the suitcase. Starting at the middle, place one pin. Pin around the edges, and sew. Ease around the corners, sewing slowly. Repeat steps 7-9 with the lining, this time using 3/8 inch seam allowance. Since these pieces have Peltex, it's harder to sew. This is why it's really important that you cut the Peltex a bit smaller than the fabric. The next step is going to be to attach your zipper. This suitcase works perfectly with a 28 inch non-separating zipper. The problem is that it’s very difficult to find a non-separating zipper in this size. No worries though! We can make one! The best thing about making your own is that you can get the zipper just the size you need. In fact, I’d recommend measuring your suitcase and comparing it to the zipper size to make sure it’s just the way that you like it. Let’s begin with a 30 inch separating zipper. Cut the bottom two inches off of the zipper. Use needle nose pliers to remove the bottom teeth from the zipper. 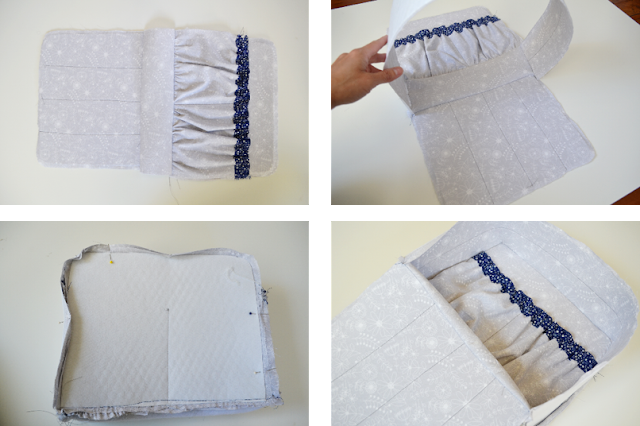 Grab a small piece of fabric (matching your suitcase side) and sew to zipper along lower edge. Be careful, as if your needle hits the teeth it can break your needle. A zipper foot is helpful for sewing close to the teeth. You’ve successfully converted a separating zipper into a non-separating zipper. If you’d like, finish the edges of the fabric piece. We are now going to attach your zipper. Begin by placing your lining inside of your outer suitcase, such that the right sides are facing each other. Begin by laying out your zipper along the flap side piece. Separate your zipper. Begin pinning (or use clips) to attach each zipper side to the lining and to the suitcase front. In this region the zipper is attached ONLY to the suitcase front. This is necessary so you can turn your suitcase right side out. You can pull the end of the zipper (the piece that has the fabric you attached on it) out between the layers, so that it will stick out in the finished suitcase. 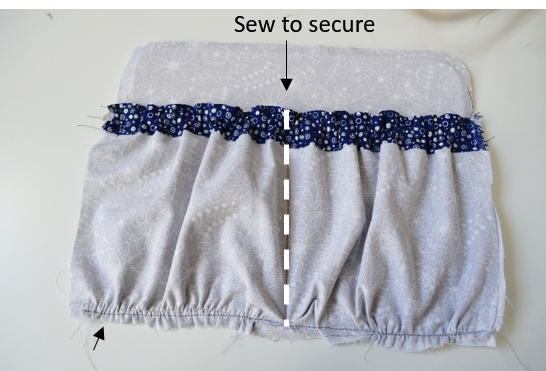 After sewing, your zipper should be attached all around, except at the region noted by the arrows, where it is only attached to the suitcase front. To do this, tuck raw edges of the fabric in, and then sew all along the edge of the top of the zipper. This closes the hole and adds some nice top stitching detail. This completes your suitcase. You can either tuck the zipper end in to the inside of your suitcase (as shown below) or have the tail stick out a little bit. I hope you enjoyed this (rather extensive) free tutorial and the little peak into my fairytale doll pattern! And if you liked this post and found it helpful, please consider following me via email, on facebook, pinterest,twitter, or instagram. 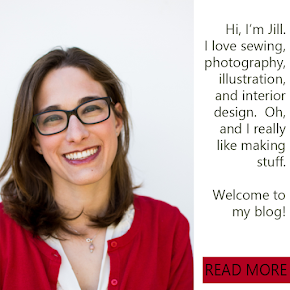 I'm really trying to build my blog audience so that I can have more opportunities to take on bigger projects, and I can't get there without your support. Thanks so much! I shared this project on Sew Can She's Show off Saturday! Click on over to check out the other great entries! love the suitcaae. quite a project! Thank you.